Calls for DUP MLA and Stormont speaker Robin Newton to resign came this morning, after a year-long investigation by BBC Spotlight was broadcast last night. Calls for DUP MLA and Stormont speaker Robin Newton to resign this morning. They come after a year-long investigation by BBC Spotlight broadcast last night. It accused Mr Newton of having misled MLAs about the true nature of his role with the UDA-linked community organisation, Charter NI. 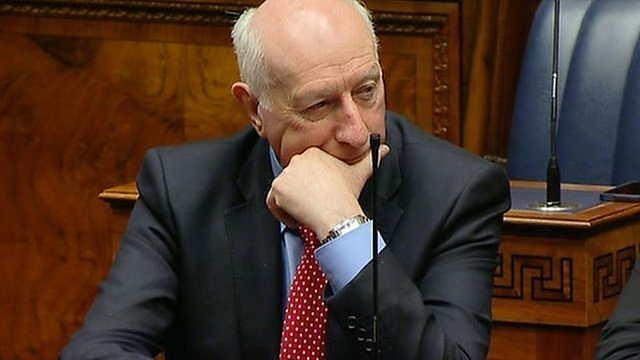 Stephen spoke to TUV MLA Jim Allister, SDLP MLA Nichola Mallon and Alliance MLA David Ford. Also on the programme, a woman who carried an anti-DUP placard at this year's Belfast Pride march has been interviewed by police. 24-year-old Ellie Evans was holding a sign which read 'F the DUP' - you can fill in the missing letters there yourself. She has accused the PSNI of being heavy-handed in their response to a complaint made by DUP MLA Jim Wells. Stephen spoke to Ellie this morning and we took your calls. And, this week BBC Northern Ireland is teaming up with Libraries NI to celebrate Book week. It is a great opportunity to talk about books, to read and discover something new, or to start reading again. Of course, the Nolan Show has been running the Biggest Book Club in the country for a year now. Cathy Rentzenbrink's 'A Manual for Heartache' is our next book to be featured. The author is amongst the line-up for the BBC Mount Stewart Conversations which will bring Book Week to a conclusion on the weekend of October 14-15. Stephen spoke to Cathy this morning along with BBC NI's Tara Mills.